Gaming is big business and it is nice to see that budget users can now experience the same stunning visuals as those with monster PC systems. Well... perhaps not quite to the same degree, but close. One of the real benefits of the videocard wars is that ATi and nVIDIA have been consistently integrating state of the art technology into entry level and mainstream videocards in an effort to out flank one another. Anti-aliasing, Anisotropic filtering and high resolutions is generally out of the question, but those are the luxuries that gamers in the heat of battle can get by without. When is the last time you were in a clan match and noticed how beautiful the terrain looked with an artillery strike coming? nVIDIA recently addressed a rather large performance gap between its entry level and mainstream products by introducing the GeForce 6600LE GPU. It uses the same NV43 core as the mainstream Geforce 6600GT videocard, but this time around the NV43 has been teamed up with TSOP-II 400 MHz DDR memory which dramatically cuts down costs. 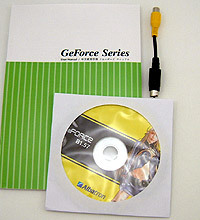 Videocards based on the new GeForce 6600LE core, like the Albatron PC6600LEQ, can be had for around $100 US. That makes these cards very price competitive. 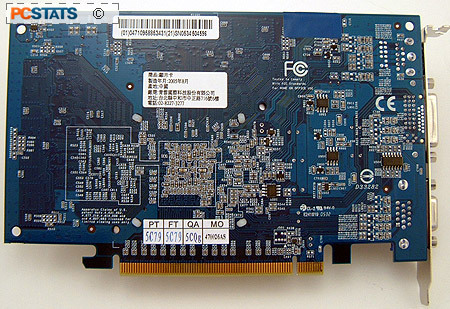 The Albatron PC6600LEQ videocard is teamed up with 256MB of memory, it supports TV-Output and since it is passively cooled, does not generate any noise at all. The RAMDAC on the Albatron PC6600LEQ runs at 400 MHz and will provide a crisp 2D display all the way up to 2048x1536 @ 85 Hz. The Albatron PC6600LEQ is pretty plane; a compact blue PCB with large (single slot) passive heatsink that makes it ideal for HTPC or SFF PC use. Like all modern videocards, the PC6600 LEQ supports dual monitors. It does not ship with a DVI to analog converter however. At low speeds the nVidia NV43 core does not generate too much heat. This is why most GeForce 6600LE videocards will come equipped with a small active cooler or in the Albatron PC6600LEQ's case, a large aluminum passive heatsink. The GeForce 6600LE GPU does not support core temperature monitoring but heatsink temps hung around the 40C mark at load according to a Fluke 54-II thermometer. Touching the heatsink, it felt like the memory was producing more heat than the GPU actually was. 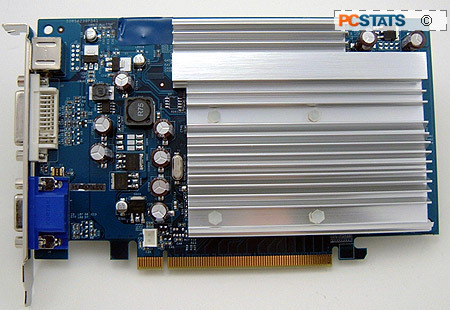 Should you want to replace the stick passive heatsink with a third-party solution, GeForce 6600 style coolers are compatible with the videocard mounting holes. The Albatron PC6600LEQ only supports traditional 4:3 TV-Output so if you plan to build a high definition HTPC, you will have to choose something else. A bit disappointing since most cards in the PC6600LEQ's class and lower sport component output. nVIDIA has greatly relaxed its SLI requirements and even entry level videocards can double up. Officially, GeForce 6200 and the 6600LE models run SLI through the PCI Express bus and are not supposed to have the bridge connector. 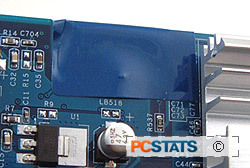 However if we look closely at Albatron PC6600LEQ we find what looks remarkably like an SLI connector hidden behind some blue electrical tape. It could just be Albatron engineers saving R&D time by re-utilizing GeForce 6600 PCBs for its PC6600LEQ videocard. In any case, should you want to SLI two GeForce 6600LE videocards that can be done just fine through the PCI Express bus. Just because the Albatron PC6600LEQ is not the fastest videocard does not mean overclocking is less fun. By default, the core and memory are clocked quite conservatively at 300 MHz/400 MHz respectively. As usual the GeForce 6600LE core was the first thing to be overclocked. With GeForce 6600GT cores clocked at 500 MHz by default, it looked like the Albatron PC6600LEQ's core might have a lot of headroom in it. Starting at 300 MHz, the core speed was increased 10 MHz at a time. Things went by quite smoothly and the little NV43 core had no problems cracking the 400 MHz barrier. At 440 MHz, the system started locking up randomly when running 3D benchmarks. Lowering the core speed 1 MHz at a time, to 437 MHz, allowed the Albatron PC6600LEQ to run through all benchmarks without error. Next up was the memory overclocking, and one again speeds were increased in 10 MHz jumps. The passively cooled memory easily broke the 500 MHz mark but did not go much past that. At 510 MHz, visible artifacts started to show up, lowering the core to 507 MHz cleared up everything.